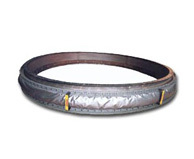 The Gas Turbine Exhaust Expansion Joint, has been designed and utilized to address the stresses, and temperature ranges that come with these applications. Proper service data will ensure the accurate engineering and material choices (High temperature fabrics, pillow materials, and metallurgies), for longevity in service. For this, and all your expansion joint requirements, please call the A.R. Thomson Group location nearest you.